HOSI Wien was founded in 1979 and is Austria’s oldest and most important lesbian and gay organisation. One of HOSI Wien’s many tasks is political lobbying. Their activities are targeted towards government ministers, members of Parliament and other politicians as well as political parties and authorities, the media and the public in general to promote the causes of gays and lesbians. To discover more about HOSI Wien’s activities, we interviewed Peter for our usual Member’s Monday appointment. 1) What is your name and your role inside HOSI Wien? My name is Peter Funk, I’m head of the Youth-Team of HOSI Wien with three others. I also work in the Team that is responsible for the Regenbogenparade, Gay Pride Parade that is, and Regenbogenball, a great classic Viennese Ball. 2) What is a very exciting project HOSI Wien is currently working on? In the last months, our organisation was very busy with the expansion of our Community Center, “Café Gugg”. It was a though time for those involved in the process, but it was absolutely worth it. Since HOSI Wien is a rather old and well-structured organisation, there are many projects that go on routine: our information project for schools the “Queerconnection”, our Thursday youth meeting with up to 90 young LGBT folks every week, the Ball, the parade, several cultural events and of course some work with LGBT refugees. 3) What is a priority in HOSI Wien’s agenda? Since the most important “legal” demands are served, our most important topic is information and education work for the last remaining legal demands (expansion of non-discrimination laws and equalisation of civil partnerships and usual marriage). 4) Why did HOSI Wien want to become a member of IGLYO? The decision to become part of IGLYO was made before I started working for HOSI Wien. However, I think one of the most important things for the Gay Community is networking. Everyone who did some work on local or national level knows how important, but also difficult it can be. And international networking is crucial for our political movement on the long run. The advices I have for young LGBTQI students depend on their situation. And I don’t want to use a platitude like “be as you are!”. I think it is important to be active in society and try to change things for the better. Indeed, “Rights are won only by those who make their voices heard.” – Harvey Milk. Would you like to know more about HOSI Wien’s work? 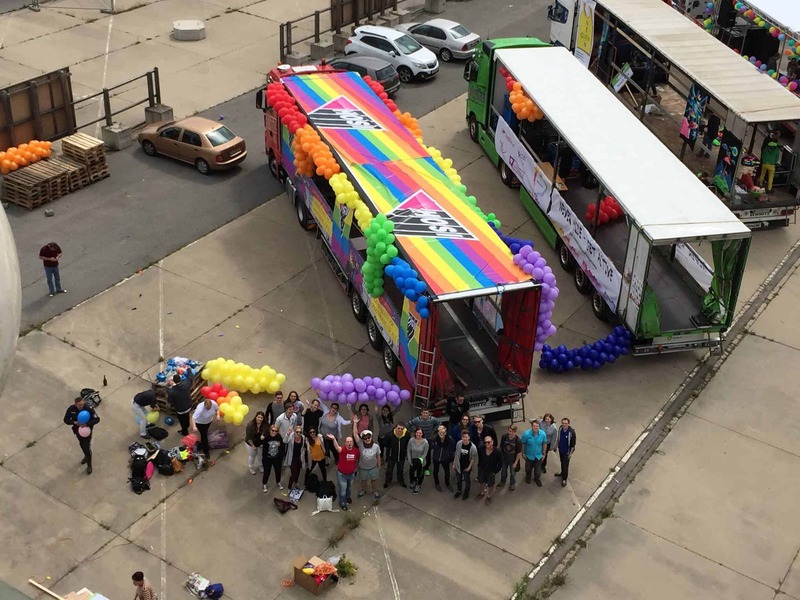 HOSI Wien team arranging the HOSI Wien’s truck for the Pride parade. Photo courtesy of HOSI Wien.